Thomas Jospeh Glassic was born April 17, 1954 in Elizabeth. His parents divorced when he was a boy and he and his two sisters was raised primarily by his grandparents. A top student and athlete in his youth, Tom had only a passing interest in football when he entered Watchung Hills Regional High School. But his homeroom teacher freshman year was also the freshman football coach, and he talked Tom—who was already over 6’ and 200 lbs.—to try out. Injuries plagued him his first three varsity seasons, but he did well enough as a senior to earn a scholarship from the University of Virginia. 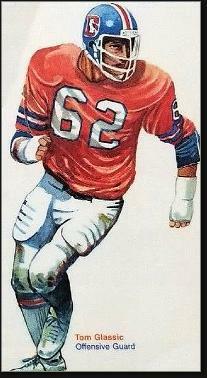 The Cavaliers were in rebuilding mode and Tom won a starting job on the offensive line as a freshman and starred for the team from 1972 to 1975. An avid reader, Tom earned a degree in English and planned on becoming a teacher. His passion was actually history; he was intrigued by military leaders, most notably Napoleon Bonaparte. He amassed a huge collection of toy soldiers and military miniatures. The Cavaliers went 4–7 in each of Tom’s first three years, and then won just once his senior year. A pro career was far from his mind when he learned that the Denver Broncos selected him in the first round of the 1976 draft as the 15th overall pick. He started every game for the Broncos as a rookie at left guard as Denver went 9–5 and just missed the playoffs. The following year, the Broncos won 12 games and defeated the Steelers and Raiders to reach the Super Bowl. They lost to the Cowboys 27–10. Tom remained a starter through the 1982 season and then served as a sub in 1983. The Broncos returned to the playoffs three times but never made it past the opening round. At 6’3” he had the size to play guard in the NFL, but his weight was always concern. Whereas most of his teammates were fined for being overweight at the weekly weigh-ins, Tom drew several $25 fine being underweight. A knee injury—one of many dating back to high school—knocked Tom out for the 1984 season and a comeback attempt with Seahawks in 1985 ended when team doctors informed him that they could not find the ACL in one of his knees. After retirement, Tom was among the many players who suffered from chronic and often debilitating pain—in his case his back and knees. Within a decade, he was physically unable to hold a full-time job. Fortunately, Tom’s taste for battle enabled him to win a disability settlement from the NFL in his 50s—a rare victory at the time.